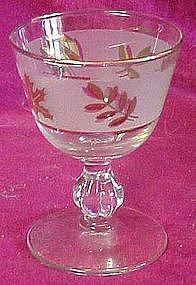 Libby's gold leaf or golden foliage liquor or cocktail glasses are in very nice condition with no chips or cracks, Thick bottoms with stems, frosted band centers with assorted gold leaf details and gold edge trim. I have 6 available in this size. Theyare nice and bright. Price is for each. I will be listing lots of other golden foliage pieces too. They measure 3 7/8" tall.